One of the elements that I look for a good book is the character. I love how Billy Taylor included only few characters that you can easily distinguish who's talking in every scene. The main characters are Ethan Knight and August Bishop, whose names can be easily remembered. 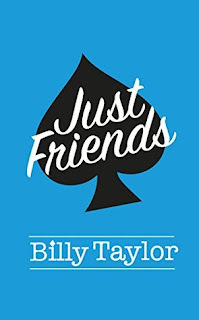 Tho the story is typical girl-best-friend-loves-boy-best-friend plot, there is something fascinating about every chapter. But I guess this helped Taylor to gain readers because this kind of story is the one mostly everyone can relate to. I, honestly, can relate to the story, knowing that the P.O.V. of the story was from a girl as well. The conflicts in the story are too good to be true. That's the only part I don't like in the book. I expected worst scenarios that the main characters could have experienced. Nevertheless, the story was well-ended. I don't feel that it was a cliff-hanger because I liked how it ended. I guess it don't a sequel, for the story may become boring. I recommend this book to teenagers who are looking for young-adult genre books and for those who love romantic books very much. I found out about this book from some tweet posting a pic of one of the scenes and it got me hooked to reading it. Also the pic of the hot author was just a bonus. Did you order your book online?